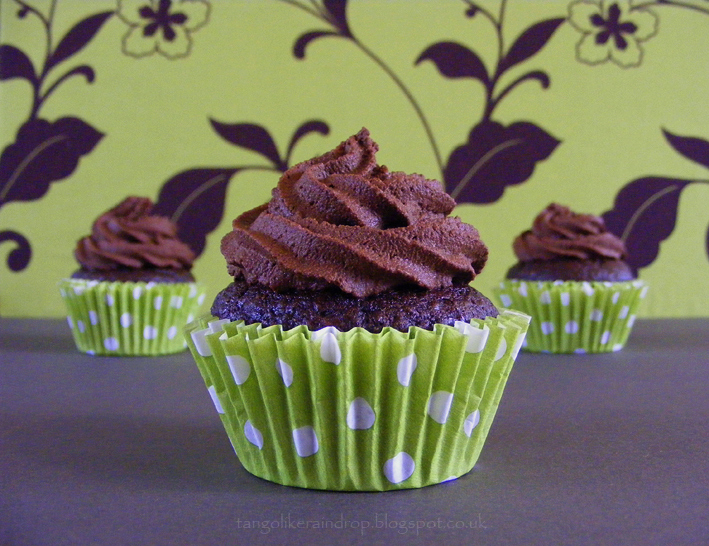 Some time ago a fellow food blogger wrote about using avocado in chocolate frosting instead of butter. I like avocado, but I was sceptical – wouldn’t you be able to taste the avocado? HHrrmmm.. I dunno. I filed the idea away in my brain as something to try at a later date. Then, this month’s Alphabakes challenge, alternately hosted by Caroline from The More Than Occasional Baker and Caroline from Caroline Makes, is all about the letter ‘A’. We’ve been tasked by this month’s host Caroline to bake something delicious using an ingredient starting with the letter A. Well there we go, no excuse now, the avocado frosting was begging to be tried. This recipe also uses agave syrup. Two A’s, we’re off! Wednesday evenings are pudding night in our household. This gives the children (and adults) something to look forward to and gives me something to tell the children the rest of the week when they’re asking for something sweet after dinner. “It’s not Wednesday – Wednesday is pudding night, remember?” It’s worked thus far. This week I tricked them. I made these fantastic chocolate cupcakes and I didn’t tell them what the secret ingredient was. I wanted to see if they noticed anything different. The eldest was particularly fond of them, making all sorts of ooohing and aaahing noises while devouring his. Then he pipes up, “It’s got an aftertaste.” My heart jumped in my throat but I kept a calm composure. “What sort of aftertaste?” I asked, innocently. “Chocolate!” he replied, and kept eating. DD (6) ate two, gleefully, but I suspect the youngest (DS 4) knew there was something different. To be honest he usually just licks all the frosting off his cupcakes, leaving the cake untouched. He licked about half the frosting off his, gave me a peculiar You’re trying to pull the wool over my eyes sort of look and then left the rest uneaten. An hour later he came back and did the same thing again with a second cupcake. The OH knew there was avocado in the frosting and made ridiculously funny faces while eating his. He didn’t much care for it, but he ate the whole thing anyway, so not to be rude (he says). He said the icing looked pixellated. “8-bit food,” he said. Food critic in the making there, don’t you think? Personally, I think they’re fantastic. I’m pretty sure I can taste the avocado in the frosting, but I like avocado so it’s ok. It’s got quite a different texture than butter cream, but it doesn’t give you that sickly sweet make you feel sick in the back of your throat feeling that butter cream can. Plus, it’s a reduced sugar recipe, contains some wholegrain flour and no animal ingredients whatsoever, so I kind of feel that it’s almost good for you, even though it’s chocolate. My recipe is based on one I found here but I changed some of the ingredients and quantities. The original recipe uses no sugar and a silly amount of agave (I think) and I’ve got it in my mind that sugar is required to give cake a nice cake texture, so I replaced some with soft brown sugar. This was my first time using coconut oil too and I wasn’t sure what I was supposed to do with it since it was solid out of a jar, so I gently melted it and added it with the rest of the wet ingredients. It worked. The vegan cupcakes are very cake-like in texture and so incredibly moreish. They taste even better the second day. 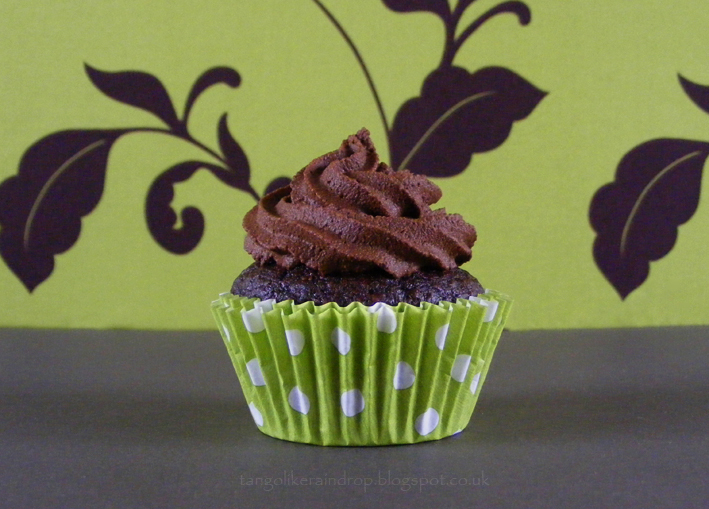 A deliciously decadent dark chocolate cupcake. 1. Preheat oven to 160 C/ 325 F. Line a 12-hole muffin tin with cupcake liners. 2. In a large bowl sift together the flours, sugar, baking soda and salt. 3. Heat coconut oil in a medium saucepan over low heat just until melted. 4. Stir the agave syrup and apple cider vinegar into the coconut oil. 5. Add vanilla to the hemp milk and then add all the wet ingredients to the dry. Stir until well combined. 6. Spoon into the cupcake cakes and bake for 15-18 minutes. 8. To prepare the avocado frosting: place avocado, cocoa powder, agave syrup, vanilla and hemp milk into the bowl of a food processor. 9. Melt chocolate in a bowl suspended over a pan of barely simmering water. Allow to cool slightly and then pour into the food processor. 10. Pulse in the food processor until the desired consistency is reached. They sound great. My diet is dairy free and I’m trying to increase my raw intake so I’ve been playing with avacados and I must say they have fast become a favourite ingredient. Thanks for ur sweetest recipes! I’m a avocado lover. But I had never tried to use avocado in chocolate frosting instead of butter. Sounds soooo good! I had featured u in the post of Deep Love to Mother: Top 7 Recipes Based on Yummy Chocolate on AllFreshRecipes. Expect ur more delicacy. I’ve been wanting to try an avocado cake recipe ever since I saw it on a blog a while back now. These look absolutely fabulous and it appears to have passed the taste test! Thanks for entering AlphaBakes. 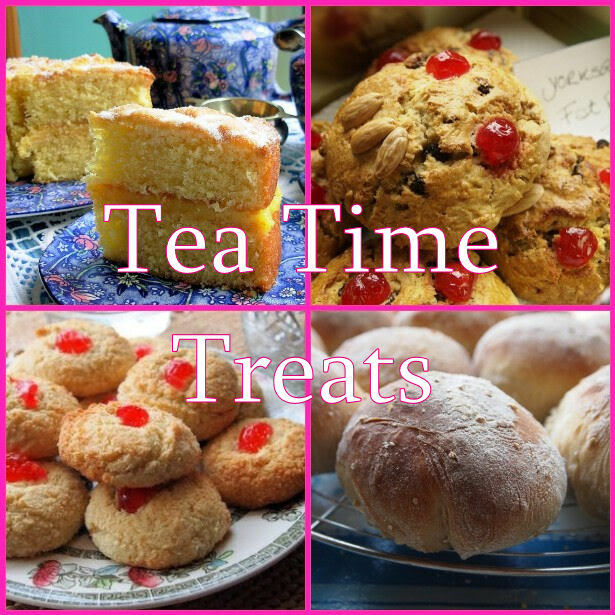 I do hope you try one – you’ll likely be pleasantly surprised too! Hee hee! We’re mischievous parents! It’s a new combination for me too – but I do love trying out new things! The chocolate frosting looks so rich and inviting. I’ve been toying with the idea of using avocado in a chocolate mousse for a while but I hadn’t really thought of using it as a substitute for buttercream so thanks for sharing this. I’ve recently been converted to hazelnut milk and I imagine that could work well with the chocolate and avocado frosting. Hazelnut milk sounds lovely! I bet it would add a lovely flavour indeed. Those are such fabulous photos Elizabeth, I think even the most hardened avocado hater would be hard pressed not to want to try one of these. I’ve seen a few chocolate avocado recipes recently and I could have sworn one of them was on your blog – my brain! It’s been on my list to try for a while and one day I will do it. I’ve baked cake with avocado a few times but only had one not-terribly-successful attempt at making chocolate frosting with avocado – well it was a topping for a slice that went wrong. I must try it with a proper cake some time. I love the green in your photos – that is the shame of avocado in chocolate baking – you lose its lovely colour! That’s so funny – it just reminded me of the first time I made it for my kids. They still don’t know it has avocados in it. I’m pretty sure it was you who first introduced me to the idea of using avocado in chocolate frosting. I was toying with the idea of not telling mine after they ate theirs, but I did, and they still came back for more! I LOVE these cupcakes, Elizabeth! I’ve never heard of hemp milk before so I need to go Google that 😉 But using avocado as the binder/fat for the frosting is genius and the results are beautiful… Thanks so much for sharing! Thank you, I’m glad you like them 🙂 Any kind of milk can be used, but I had a choice between hemp or soya as that what was in my cupboard!